After a few weeks on the job here in the cellar, the winemaker and the company viticulturalist rounded us rats up and hauled us out to see some grapes. It was time, they said, for us to see where our bounty will be coming from. And not to worry, they’d have us back in time for afternoon beers in the cellar. This is an estate winery that owns a lot of the vineyards it sources from, though we also have contract growers. But like at Donelan, the vineyards aren’t right outside the cellar door. They are spread all over the Hawke’s Bay. So we trucked out to see some Chardonnay, Pinot Noir, and Syrah at three of our vineyards closest in ripeness. 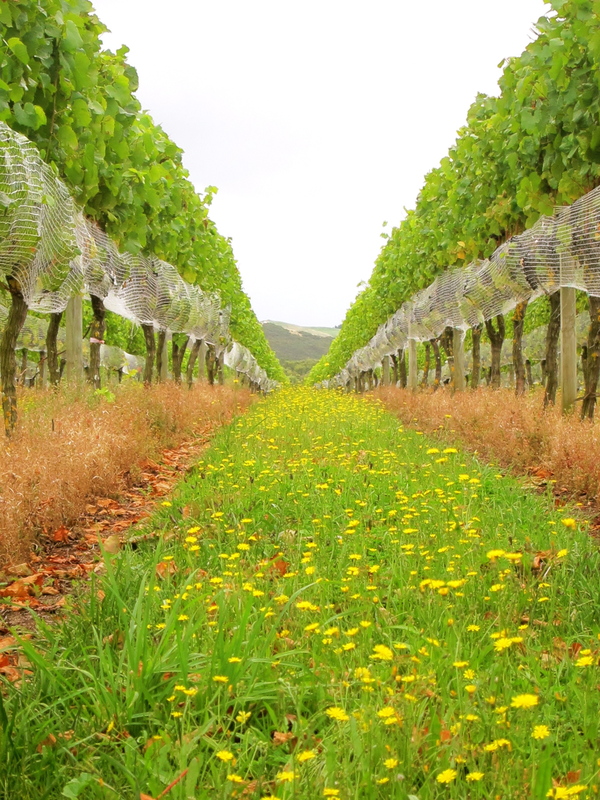 I’ve mentioned how much NZ’s 2012 vintage to date is reminiscent of CA’s 2011. Most fruit is wildly behind schedule because summer never really came to the Bay this year. The sun gets baking hot when it shows up – sometimes the heat physically hurts – but most days have been cloudy, if not rainy. Sunlight hours are crucial for ripening the fruit at this stage. Many vineyards barely pulled through veraison, stalling out with multi-colored, half-baked clusters or tough green berries that won’t make the cut. 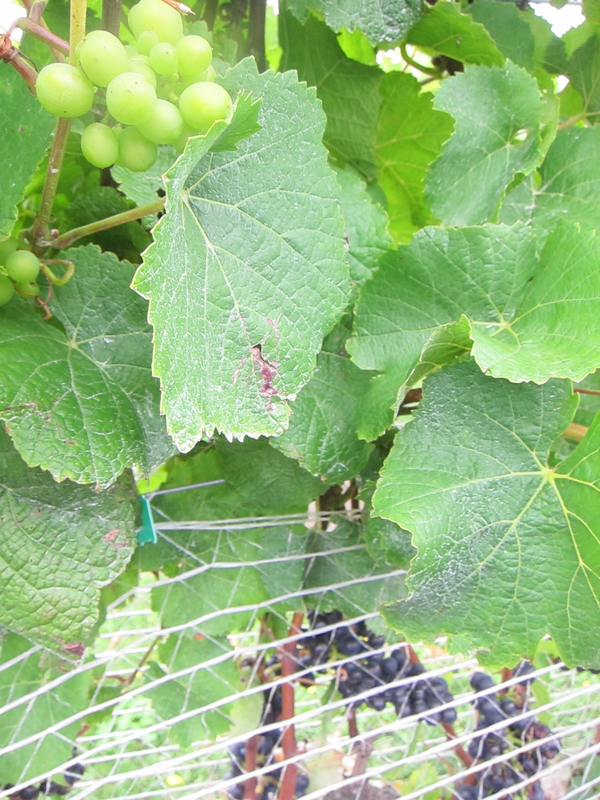 Most vineyard teams have been out for weeks dropping green fruit – to kick things up a notch and in hopes of reducing lengthy and laborious sorting – and cutting back canopies to maximize sun exposure. With these cool temps and rain, they don’t want to let things ripen in their own sweet time; the risk of rot is too high and already threatening vast amounts of fruit. They also have to be cautious with their trimming; a sudden heat spike (not impossible) could fry unshaded fruit. The Chardonnay and Pinot berries we sampled had good flavor and are hovering around 19 Brix – strong candidates for our first fruit. Walking out in the vineyards, I was again struck by the change in scale from my last gig. These are simply massive vineyards and given their size and their number, it boggles my mind that the viticulturalist can keep his eye on the endless variables and variations within and across all of them. He showed us a depression running through a Syrah vineyard, a remnant of a river that has since moved; the fruit growing in the depression area has noticeably less mature fruit flavors, mostly because the soil there is denser from its riverbed days and holds moisture. The free-draining, rocky, gravelly, or chalky soil surrounding the depression is far more desirable for grape growing, because the right amount of struggle, as they call it, in the vines produces better and more concentrated flavor and ripeness. Viticulturalists have to mete out irrigation carefully to hit the sweet spot in different blocks and microclimates. 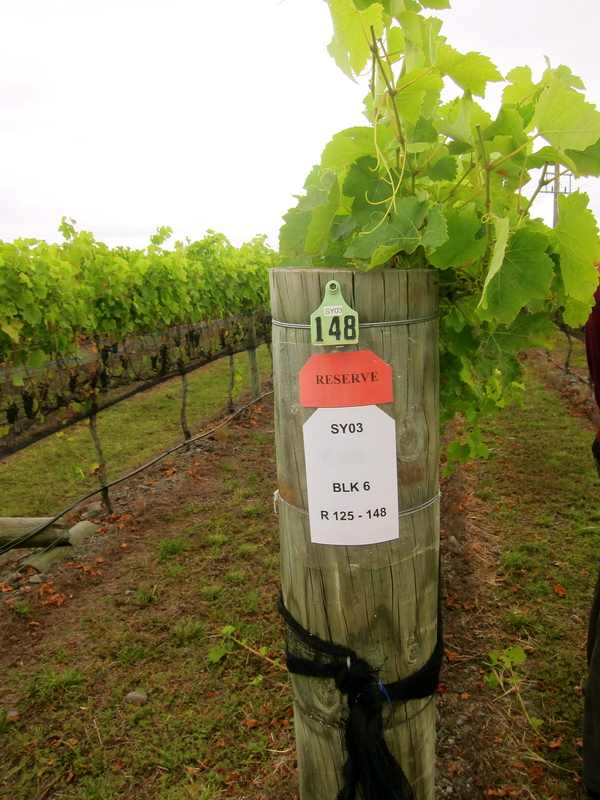 The most esteemed appellation of the Hawke’s Bay is known as the Gimblett Gravels, where most of the established names in Hawke’s Bay winemaking get some if not all of their fruit. 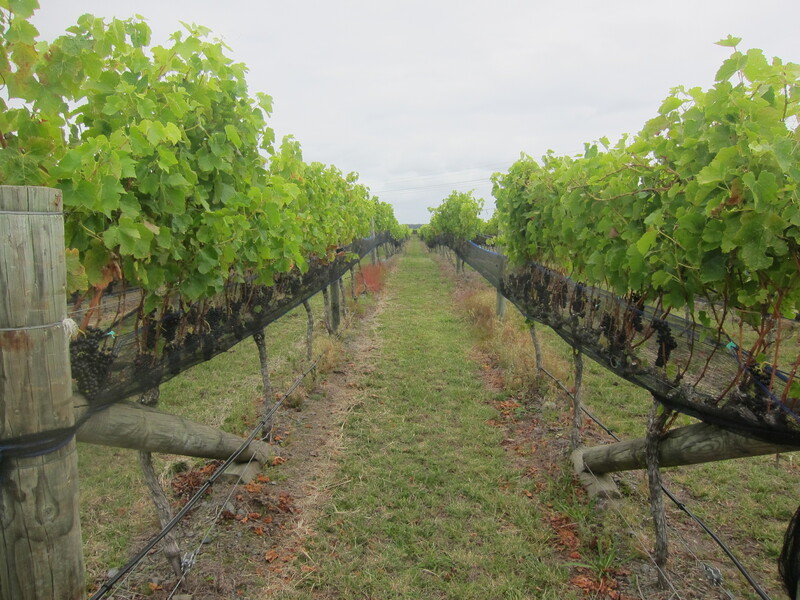 We checked out one of our Syrah vineyards here, where the gravels drain so well – and there’s no top soil to speak of – that the canopies naturally can’t grow taller than in the photo bellow. 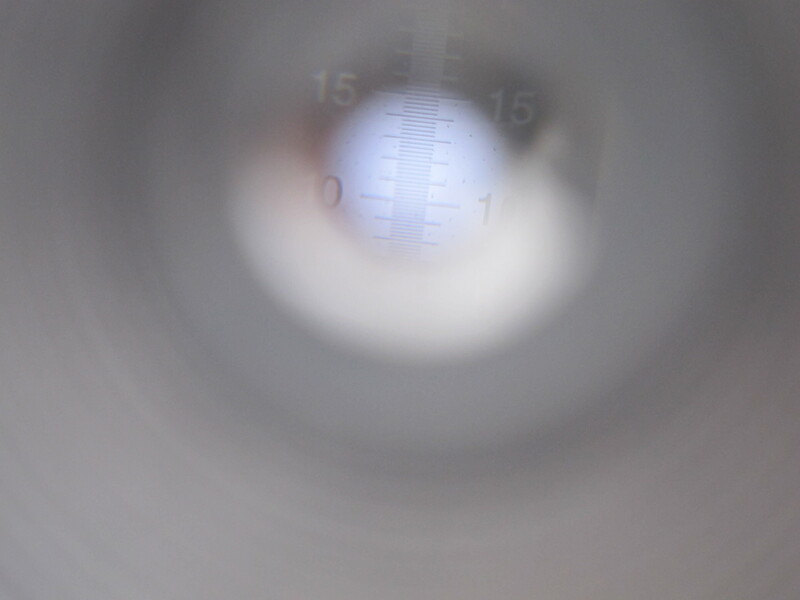 One of the viticulture toys we played with out in the vineyard: a portable refractometer. You pop a berry onto the flat blue plate on the right hand end and put the other end up to your eye like a telescope. The light refracts in relation to the berry’s density – which is a function of its sugar content (ie, Brix). A graduated scale is visible through the sightglass on the left hand end, with a line indicating the Brix. Pretty handy. In the vineyard photos, you’ll notice as I have the prevalence of bird netting. 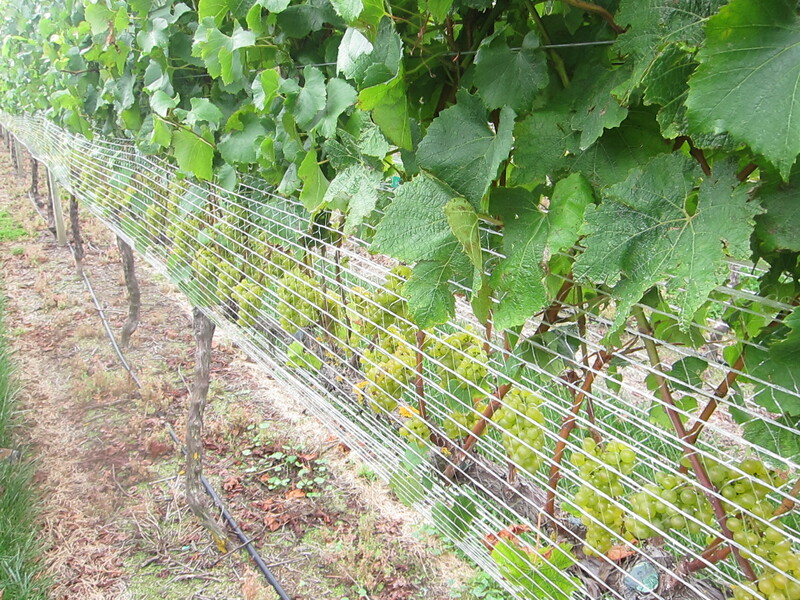 I don’t think I’ve seen a single vineyard without complete netting, which is kind of astonishing given the acreage involved; these nets have to be hung by hand. That’s a lot of netting. 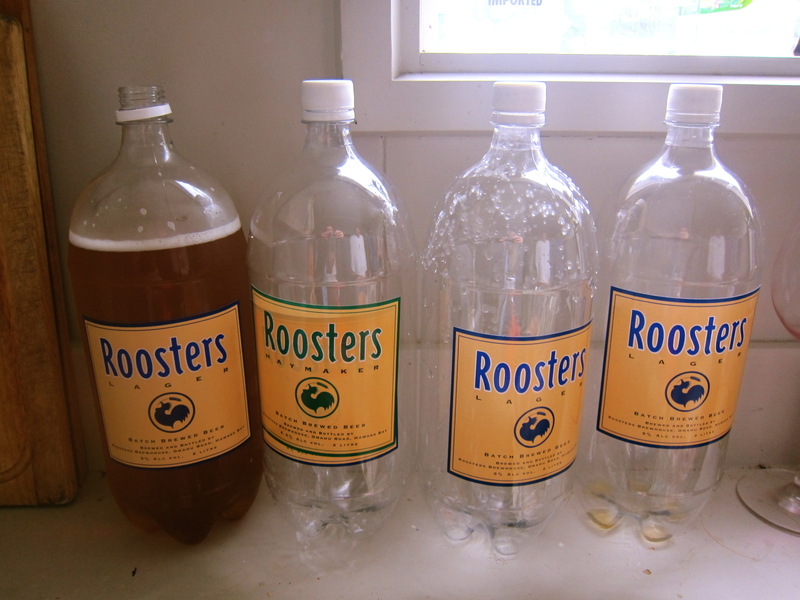 But birds and bird-pick – the pecking damage left by their snacking – are a big problem here. 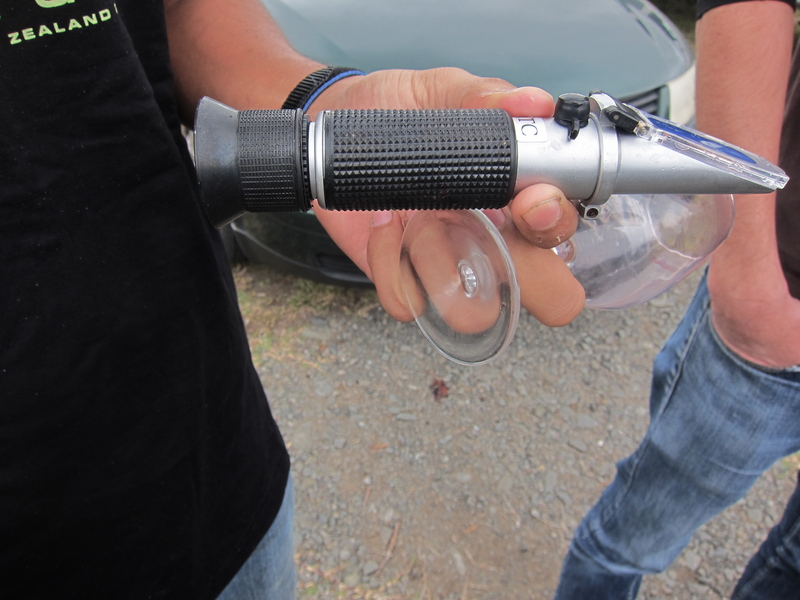 Vineyard teams often carry pellet guns and many vineyards are equipped with automated shot-gun sounds meant to scare off birds. This takes some getting used to. They’re loud. Friends who live out in vineyards say they don’t even hear it anymore. It was important to get out into the vineyard. I had been feeling pretty cut off from the larger picture until getting out into the vines. The winemaker here is a good and friendly boss, always happy to answer questions. But given the size of our team, I’ve mostly reserved my ordinarily endless stream of questions for my knowledgeable and experienced coworkers rather than pestering my supervisors. And with no grapes in the winery, I was beginning to forget just how basic and wondrous this whole process is: grow the fruit, ferment the fruit, try not to get in its way. 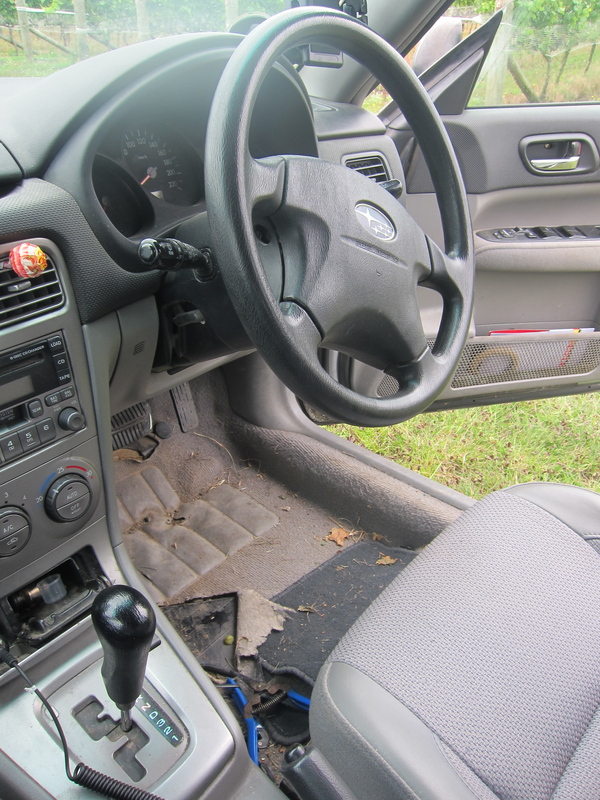 So it was nice to pile into a muddy Subaru littered with pruning shears – an uncanny replica of CA winemakers I know – and let my questions fly. And it was also nice to just to be out there with the fruit – not just any fruit, but the same fruit that will come streaming through the cellar soon, a hundred tons at a time. The anticipation is growing and reminiscent of those heady days in Sonoma where the entire region seemed to have some phantom engine beginning to roar into high gear. We are fiending for fruit. At a recent party, we who still have our weekends off excitedly cheered on a friend as he tore himself away to go home and get some sleep before crushing Pinot at dawn. Hot damn. In other news, this lifetime English major can now run her own free-sulphur tests in the lab (more on that soon). This is basic lab work, so my sense of triumph is a little out of proportion and is mitigated by evidence of my continued stupidity: an angry patch of skin on my forearm from a caustic burn.